Often images are the bane of the website content manager’s existence. Finding them, making sure you have credit for them, resizing them properly… It’s all quite tedious and often can take longer than the actual written content! So when my colleague showed me how he resizes images using the Fotor collage creator, I got pretty excited. He uses the collage creator not for its intended use but I think it’s going to save me a lot of time. This is especially useful when you’re working on a site where you need to upload the exact same size image. In this case, it’s best to set up the Fotor collage creator once and then leave it open, ready for your use throughout the day. This hack can work for images saved on the computer but as far as I’m concerned part of the fun of this hack is that it works with images from the web without having to download them first to your computer! 1. 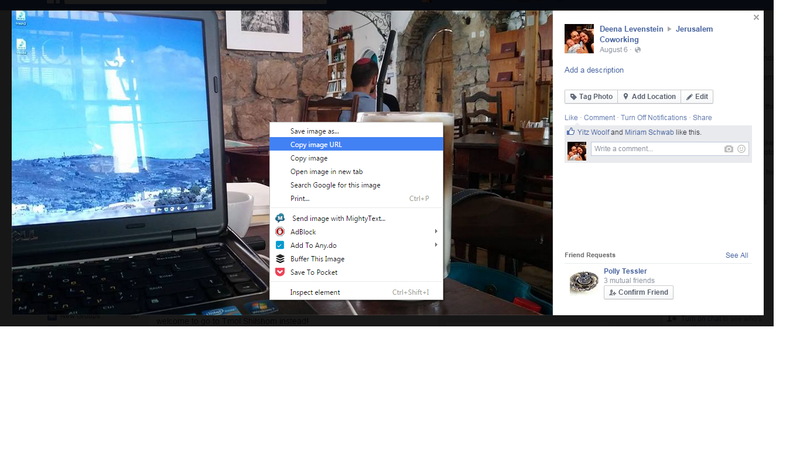 Find the image you want on Facebook, right click on it and save the image URL. 2. Go to fotor.com and click on MAKE A COLLAGE. 4. In the collage area, delete all the extra boxes until there is only one left. 5. The border will be automatically set at 10. You can change it to zero also on the left hand side. 6. Click on the down arrow next to “Open” and the click on “Web,” the bottom option. 8. You’ll see it load in the bottom right hand side of the screen. 9. Drag your photo into the collage space and drag it around until it’s situated the way you want. 10. When you’re done, click on the save button which looks like a floppy disk. Done. Do you have any awesome ways you edit photos for web? Please share in the comments! How many of you writers differentiate properly between the usage of the hyphen, the en dash and the em dash? Not yours truly! Until today, that is. I hereby vow—well, not exactly, of course—to explain to you how to use these three little beauties properly in your writing and to then use them properly myself. I went to the store—the one on Keren Hayesod—and I bought the damn apple. The apple turned out to be rotten—or so I believe. Now how do you create en and em dashes in WordPress? Aha! This is the second most exciting part of this post. Turns out WordPress is all ready to go with en and em dashes. I learned from this post that if you simply write two hyphens next to each other, without spaces, you’ll get an en dash and if you do the same with three hyphens, you’ll get the em dash. All this being said, is this whole topic passe or do you think it really is good for writers to make sure to use these punctuation marks properly? In any software program that handles text, the em dash can be typed on an enhanced keyboard as Alt + 0151—that is, hold down the “alternate” key and type, using the numerical pad on the right side of the keyboard, the numbers 0151. The en dash can be typed as Alt + 0150. Sometimes when you click on a link it opens in the tab you’re in and other times it opens in a new tab. Here I’ll explain when to choose each option and how to make a link open in a new tab in WordPress’s editor and menu. These instructions work for both WordPress.com and WordPress.org. Which links should open in the same tab? All regular links within the same website should open in the same tab. That means that if on the deena.co About page there is a link to My Writing, it should open right here, where you are. And now the above paragraph has two examples of links opening in the same tab because this piece is in deena.co and so are those links. Which links should open in a new tab? All external links should open in a new tab. So, for example, if I now mention that I have a new post on habitza.com, the link should open in a new tab. Here is a link to Dear Introverted Man,. Also, links to media should open in a new tab. For example, if my friend’s catalogue page includes a link to the catalogue in PDF format, when you click on the link to the PDF, it should open in a new tab. These rules apply for menus as well. 1. Click on the link you want to edit. 4. Save and check your changes. 6. Save and check your changes. Lingo shmingo and yet one cannot deny that if we all take a moment to speak the same language things will go that much more smoothly. WordPress clients often call items in the menu “categories,” which is understandable. The problem is that the word category has a very specific use in the WordPress Universe. WordPress has the most easy-to-use menu system. You can create countless menus and stick them in different places around the site. You can also create one menu and use it in multiple places. Tip: Menus are entered in the sidebars and footer using Widgets (stay with me! you can do it!). Got it? So the main menu in the header is called a Main Menu or a Main Navigation. Pages are static items on the site like the About or Contact page. Pages can be related to each other as parents and siblings. For example, under the About page can be Our Staff and a Mission Statement. About is the Mama Page and Our Staff and Mission Statement are the beautiful children. What a lovely little family! Every WordPress site comes with blog functionality built in. This can be used as a standard blog or as a news section or, with a creative web developer, it might be used for other things as well. Posts are individual pieces in a blog. They are time marked and they can be organized by category. These are categories I created on my site because I know I write enough about WordPress that it warrants a category (in my case, two). You will create whichever categories you need. And check it out, at the top of this post you can see that WordPress.com is a link. Click on it and you’ll get to all my content on WordPress.com. Categories are general areas of interest covered on your site. You create them as needed and categorize your posts before publishing them. How do categories connect with menus? And if you click on it, you get to this URL: http://deena.co/category/photography/. All this is to say, dear WordPress client, that items in the menu are not (necessarily) categories and are not called categories. There might be categories in the menu but a WordPress menu can be made up of anything: page, posts, custom post types, external links, categories or tags. Bottom line: Categories can be in the main menu of your site but it isn’t necessary. The main items in a menu are usually pages though they can be anything. So what do you call the different levels of a main navigation? OK. And as far as the levels, there is the top level and then there are either the second and third levels or the first dropdown and the second dropdown. Etc. etc. That’s it. Thank you for your courtesy towards WordPress nerds. Here are the WordPress services I offer. A very famous blogger (if only I could remember who) doesn’t allow comments on his blog. If someone wants to share their thoughts (or passionate attacks) about a piece, they can do it on Facebook, he said, in order to keep it more controlled and to keep his website clean. Assumptions assumptions. It is assumed that having a conversation going on your blog is some great ideal. And that it’s important to interact with your readers, replying to most/all of their comments. Why? And talk about freakin’ exhausting! How to internalize the comment – what to think and feel about it. Whether or not they should reply to the comment of question. Whether or not they should continue a conversation with the reader. Ugh! Aren’t we writers? How did we become socializers instead? Now, this is not only a problem because it takes up so much time and energy. It’s also a problem because of how it can affect a person’s writing. Having to deal so much with readers’ comments has three potential negative repercussions. It could have the writer calculating what/how/how much to write too much based on the readers. This could be misguided based on one or two verbal people who have nothing better to do than try to get your attention. It could also be based on not getting comments, the thinking being that if I didn’t get comments, it must not be a good piece or maybe I’m just not a good writer. It could make the writer obsessive about what comments she’s getting and how many. It could have her returning to a post many times on the day it’s posted in order to see how it’s doing. This activity is supposedly based on the above-mentioned assumption that it’s of utmost importance to read your readers’ comments and interact with them. But this what writing is supposed to be about? I don’t remember reading about the importance of obsessing over readership/commenting in On Writing by Stephen King. It almost definitely creates a situation where the writer becomes dependent on external feedback – writing passionately after getting good feedback and hiding miserably in a corner after negative feedback. And when you’re bombarded with feedback (silence is feedback too), it’s a creativity-sucker (or a muse-muter). I think one of the great challenges for writers is figuring out how to tap into our own feedback system and decide selectively who is worthy of our listening ears. From whom am I truly interested to hear what they think and continue developing my writing accordingly? This is a question not to be taken lightly!